A young female warrior's burial from Pokrovka, Russia. The green material on her chest is an amulet holding a leather pouch worn around her neck which held a bronze arrowhead. Her dagger is by her right femur. Photo: Jeannine Davis-Kimball. Fierce fearless female warriors and keen riders. This is how the Amazons are portrayed in Greek mythology and since the earliest written reference to them (by Homer) they have captured human imagination like little other themes. Homer calls them “antianeirai” (like men), hinting through his stories that they were so fierce in battle that it was an honour for any warrior to kill them. During the rise of Athenian Hegemony in the Archaic period, the Amazons, perceived as group of women living differently to what a woman’s role was supposed to include and led by a woman monarch, were used as a theme opposing to what the Athenians thought as order: democracy and men as society’s leaders. Iconography added up to the myth, using the “Amazonomachy” (Amazon Battle) theme very often. Still, since recently, the amount of truth hidden behind Herodotus’ accounts was unknown. However, during the early 1990s, a joint U.S.-Russian team of archaeologists made an extraordinary discovery while excavating 2,000-year-old burial mounds—known as kurgans—outside Pokrovka, a remote Russian outpost in the southern Ural Steppes near the Kazakhstan border. Over 150 graves were found, apparently belonging to the Sauromatians and their descendants, the Sarmatians. Among the tombs, several graves of warrior women who had been buried with their weapons were located. One young female, bowlegged from constant riding, lay with an iron dagger on her left side and a quiver containing 40 bronze-tipped arrows on her right. 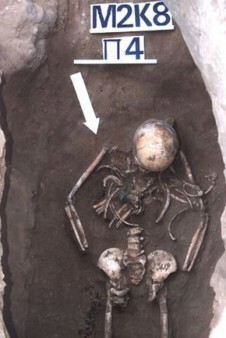 The skeleton of another female still had a bent arrowhead embedded in the cavity. On average, the weapon-bearing females measured 5 feet 6 inches, making them preternaturally tall for their time, while their skeletons still bore traces of wounds, probably acquired in battle.